While visiting New York City be sure to explore and experience the Top of The Rock Observation Deck at the world famous Rockefeller Center. 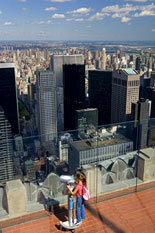 Take in 360 degree views and celebrate the grandeur of New York City. Purchase your tickets online and save! Receive an additional 5% off with coupon code NYTO5. Evoking the appearance of a luxurious ocean liner, the Top of the Rock is an observation deck on the 70th as well as the 67th and 69th floors of the Rockefeller Center. John D. Rockefeller opened the observation platform atop his Art Deco skyscraper, which is colloquially known as 30 Rock, more than 70 years ago to share his love for New York City. The philanthropist felt that New Yorkers and tourists would appreciate the magnificent view of the city skyline during the day and the glittering lights at night. Although the observatory opened during the Depression-era, this beloved, classic attraction is now completely updated for the 21st century. The observatory reopened in 2005 following a 19-year hiatus and a $75 million renovation project. A modern feature is the timed-entry system that significantly reduces the wait for the deck. Upon entering Rockefeller Center, visitors will see Joie, a 2.3-ton, three-story, 14,000-piece Swarovski chandelier. An exhibit on the mezzanine level displays the fascinating history of the building and its observation decks. Visitors can experience the construction of the skyscraper through an interactive exhibit called The Beam Walk. The center screens footage from the era of the men who “worked the steel” as they fearlessly dangled their feet high above the city during their lunch breaks. Before entering the Sky Shuttle, visitors can stop in the theater and view a short presentation about the artworks displayed in Rockefeller Center. The specially designed, glass-top elevator transports guests to the observation platform in less than a minute. During the ride, passengers are entertained with a multimedia display of lights and sound. Located on the first level of the observatory is the 180-foot-wide, 9-foot-tall, mouth-blown colored glass wall entitled Radiance, which contains Swarovski crystal clusters and figurines. The observation deck includes indoor viewing rooms as well as an outdoor promenade, 850 feet above the streets of Midtown, that provide panoramic views of New York City and the surrounding area. You will see famous landmarks, such as the Central Park, the Statue of Liberty and Brooklyn Bridge as well as the Chrysler and Empire State Buildings. The observatory is wonderful way to enjoy unobstructed views of the sunset and the seasons as they unfold across the city. A free downloadable audio podcast provides information and details about the building, its history and the spectacular view from the Top of the Rock.